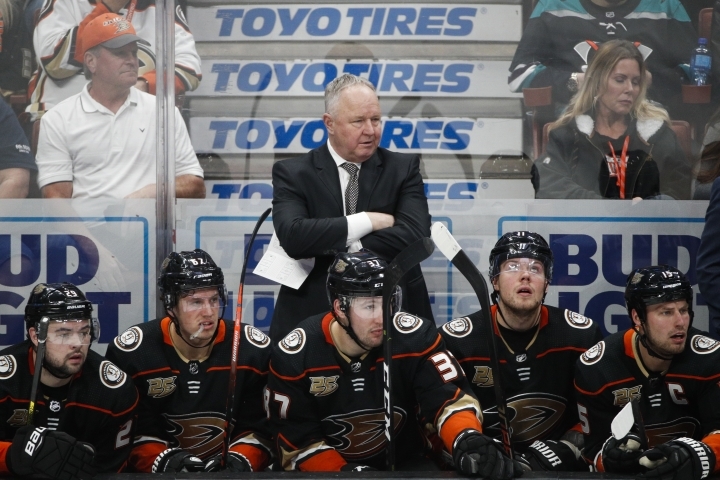 ANAHEIM, Calif. — Anaheim Ducks general manager Bob Murray tried to give Randy Carlyle as much time as possible to turn things around. But a seven-game losing streak and freefall into last place in the Western Conference showed Murray that a turnaround wasn't coming soon. Murray announced that he would take over as interim coach for the remainder of the regular season after firing Carlyle on Sunday. Anaheim will hire a new coach following the season. "What has happened here lately and how we have played, it was time for change," Murray said during a conference call. "Some people thought I waited far too long but this team has a history of coming on and charging late. I realized it wasn't going to happen a few days ago that it wasn't going to happen." After no firings last year, the Ducks are the sixth team to make a change this season, joining Los Angeles, Chicago, St. Louis, Edmonton and Philadelphia. The 62-year-old Carlyle, the winningest coach in Ducks history, was in his second stint with Anaheim. He led the team to the Stanley Cup in 2007 and three appearances in the Western Conference Final (2006, 2007, 2017). Anaheim has made the playoffs six straight seasons but won just two of its last 21 games. The Ducks were second in the Pacific Division on Dec. 18 after winning 11 of 13, but they have gone 2-15-4 since. Saturday's 6-2 loss at Philadelphia capped a five-game trip where the Ducks had been outscored 29-7, including 14-0 in the first period. Murray said he approached ownership following a 4-1 loss at Montreal on Feb. 5 that he was considering making a change. Murray was scouting in Europe, but returned and fired Carlyle during a Sunday morning meeting at the Honda Center. "Bob's obviously going to need to implement his vision of what he envisions our team doing," Ducks captain Ryan Getzlaf said following Sunday's practice. "We had a good practice, lots of talking and lots trying to understand exactly what's going on and what he wants to see out of us." Amid a 12-game losing streak last month, Murray issued a statement saying he wasn't considering a coaching change and instead was focusing on the roster. Murray shook up the roster with a couple of trades that led to two straight wins, but another losing streak followed. "It's a combination of everything but what bothered me the most was the lack of emotion," Murray said. "We've always pushed back. We never accept and they were accepting and that is unacceptable. We have to change that." Ducks owners Henry and Susan Samueli sent an email to season-ticket holders saying they have supported Murray throughout the entire process. Murray has been with Anaheim since 2005 and has been the general manager since 2008. He signed a two-year extension in December and is under contract through the 2021-22 season. Murray became the fifth person in NHL history to both play and serve 1,000 games as a GM, but this is the first time he will be behind the bench as a coach. Murray said it wasn't fair to name anyone else as the interim coach. He is also taking over the coaching reigns with two weeks remaining until the trade deadline on Feb. 25, which should allow some time to get a better gage on the roster. "It's my job. We have problems here and it has to be fixed," Murray said. "It's more problematic than I thought, and the only way it was fair to anyone was coming down here and finding out everything going on." Anaheim's next three games are at home, beginning Wednesday against Vancouver. Defenseman Cam Fowler said he hopes the change can shake the Ducks into making a late run. "Sometimes all you need is a fresh start to get some good mojo," he said. "We felt like we were just kind of stuck in neutral and as hard as we were trying to work to get things going better we just couldn't find a way to do it." Dallas Eakins, who is the coach of the Ducks' AHL affiliate in San Diego, would be among the favorites to be considered for the job going into next season. Eakins is in his fourth season in San Diego. He does have NHL coaching experience with less than two seasons in Edmonton. Carlyle previously coached the Toronto Maple Leafs. He went 384-256-96 in 736 games with Anaheim. He is the only person in NHL history with over 1,000 games played and 900 or more games coached. His career mark behind the bench is 475-334-115.